This is the second of a three-part post. See Music printing, a journey for engravers (part 1 of 3) and Changing times for music preparers (part 3 of 3). With a clear overview of music printing in the previous post, it is easy to see the role of music engravers - those painstakingly etching out wood, hammering metal, collating plates of symbols to be pressed or using incredible skill to write it out by hand. All of these methods have one purpose, to definitively print and publish music. Where do copyists fit in? No different to today, composers hundreds of years ago had extremely tight deadlines to meet. Those employed by the courts and monarchy had next to no time to write music for church services, social and countless other occasions. 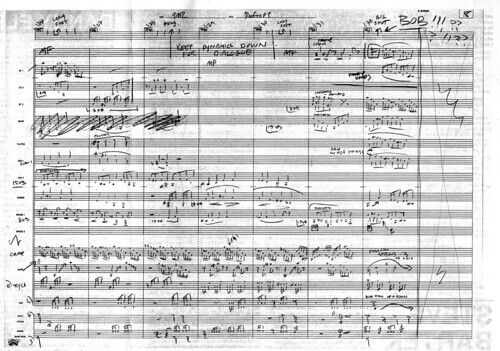 So, they used copyists to make a copy of their score, often omitting the many scribbles and corrections to produce a score ready for performance. They would also then copy out all of the instrumental parts for the players. There were certainly dedicated copyists who had done this for many years, but there were also a younger breed of copyist who were budding composers themselves who wanted to study the music of the masters - no better way than to copy their music. Copyists would most often work very closely with the composer and in the same quarters, turning up at the door simply with manuscript paper, a calligraphy pen and ruler. This is seen in the films Amadeus and more prominently, Copying Beethoven. It is well known that Beethoven had contentious relationships with his copyists and put them under huge stress and burden - it is no wonder his copyists often made mistakes. Jumping ahead to today, it is clear to see that computer software has blurred the distinction between copying and engraving, with a high quality always being produced (well, by a professional). There is now one method to create music notation, whether it be "engraved" or not. Music publishers of course set their music to that beautiful engraved standard, but do it just as a copyist creates some orchestral parts, or as a songwriter throws down some backing string ideas into the software. So, the term "music engraving" is somewhat obsolete. It is what role you have in the process and the standard of the product you produce that determines your identity. Times are always changing and now there are a greater variety of preparation needs broader terms are becoming common such as simply "music preparation". This is the second of a three-part post. See Music printing, a journey for engravers (part 1 of 3) and Changing times for music preparers (part 3 of 3).